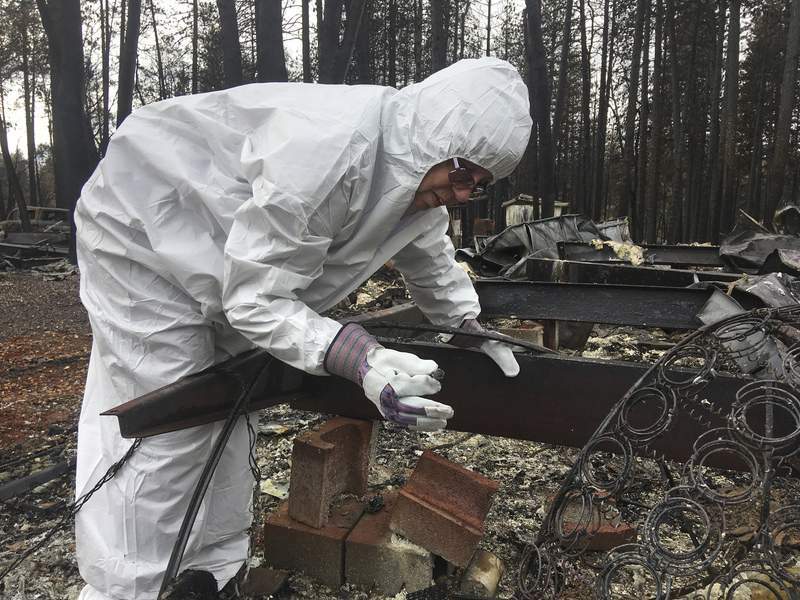 Associated Press Joyce McLean, wearing a hazmat suit, looks through the remains of her home Wednesday in Paradise, Calif. Some residents were finally allowed to return home to sift through the charred remains in search of family heirlooms and other possessions. PARADISE, Calif. – Joyce and Jerry McLean sifted through twisted metal and broken glass Wednesday on the property where their mobile home once stood, hoping to find precious family possessions that might have survived the devastating California wildfire that leveled Paradise. More than 50,000 people in Paradise and the neighboring communities of Magalia and Concow were forced to quickly flee the towering, wind-driven flames. Authorities said 11 people were still unaccounted for in what was the deadliest U.S. wildfire in at least a century.